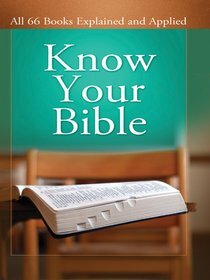 About "Know Your Bible Illustrated"
Customer Reviews For "Know Your Bible Illustrated"
This is a handy little e-book. It briefly describes all the books in the Bible. It tells you who the author is and has a short description on what the book is all about. It gives you a summary of the different books in the bible. I often use it as a reference, when I don't know who wrote the book, it provides a good context for the reading passages. This e-book is on my phone, so I carry it everywhere. I would definitely recommend this and also, it is so cheap.